These are all properties which you can easily go to without having to hire a car, ideal for a short break taking advantage of cheap flights now available off-peak. Train travel is cheap and efficient in Italy. Local bus services are available from the main centres out to smaller towns such as San Gimignano or Montalcino for those who wish to explore further afield. We can thoroughly recommend Siena as the ideal city for a short break - traffic-free, lots to see and easy to walk around. Casa Guglielmi is located in the heart of Siena, a short walk from the famous Piazza del Campo and the Duomo. Tastefully furnished, the apartment is ideal for those who want to enjoy the town on foot, and its beautiful surroundings by bus. A gorgeous panoramic views over Siena can be admired from the windows of the apartment. There are many shops and restaurants within easy walking distance of the apartment. Just before the pedestrian area of Siena city centre, on the ground floor of a two storey brick building this apartment is an ideal base for a couple that wants to experience life in the wonderful medieval town of Siena. Quality, comfortable tasteful furnishings, many of which are antiques, bring an elegant touch to the apartment. There is a laundry room with washing machine, satellite tv and internet wireless connection. From the apartment a 5 minutes walk takes you to Piazza del Campo. This apartment is located in the very heart of Siena, in the oldest part of the town, only 150 mts from Piazza del Campo. The entrance is in a old lane on the first floor, and the apartment has a spacious living room with a kitchen corner, a double bedroom and a bathroom. Just 12 steps lead to the roof panoramic terrace (10 sqm) with table, chairs and barbecue for al fresco dinners. Right in the heart of Siena, in the Contrada del Nicchio, we can offer this beautiful apartment located on the second floor of an historical building. The apartment is a perfect base to explore the splendours of Siena - it is all within walking distance and the centre of the city is a pedestrian zone. The central feature of the old town is the Piazza del Campo, a spacious scallop-shaped piazza, scene of the enthralling Palio horse race twice a year, which is about 300 mts away from the apartment. Two elegant and comfortable apartments recently restored, situated in the center of Siena, a short walk from the Fortezza Medicea and from the famous Piazza del Campo. From the windows you can admire the typical red rooftops of Siena and its landmarks. Elegant and comfortable small apartment in a residential complex derived from a recent renovation of an old hospital, situated just outside the city walls of Siena - ashort walk from Piazza del Campo. The apartment is furnished in modern style with parquet floors. 4 Lovely apartments on the top floor of an ancient 13th century convent.Recently restored. Underfloor heating, air-conditioning and WI-FI. The access to the property is via 300 m of pedestrian road, public parking 500 m away. Tranquil location with beautiful views city centre to the Chianti hills in the distance. Welcoming and charming apartment situated on the ground floor of an ancient medieval building in the historical center of Siena. This accommodation has been recently restored preserving its original architectural features and materials such as the beautiful beamed ceilings. The interiors are elegantly furnished with a nice blend of modern-design pieces and ancient furniture. The living area has splendid views over the city roofs and the Mangia tower. Quietly situated close to Piazza del Campo and the area of � La Torre�, rich in history, restaurants, pizzerias. Free Wifi. 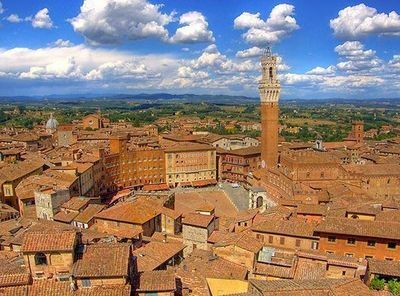 The Municipality of Siena have introduced a local tax for tourists for the first 6 nights of stay of each month. The price is 2� per person per night from 01/03 until 31/10, and 1� per person per night from 01/11 until 28/02. Children under 12 are not included. The payment of this tax is compulsory and must be in cash directly on the spot to the owner. Apartment on the outskirts of the beautiful old town of Colle Val d'Elsa, famous all over the world for its crystal glass. Typical Tuscan furnishings. First floor, with small covered terrace.Small garden. Central heating. Double, twin and single bedrooms Parking. Traditional apartments situated in the town of San Gimignano, in one of the oldest wine producing establishments of the area. Its position is unique in that it is inside the old town walls that were moved in the 15th century. Access to the winery is through one of the town's walls. Simply and fully furnished in rustic style in tune with its environment.
. Recently restored, it has been turned into a luxury rental where you can experience a unique stay. The interior decoration is a tasteful blend of ancient charm and contemporary furnishing. The tower has 10 floors and a panoramic terrace on the top, with160 steps. A 19th Century building composed of 21 completely renovated apartments. In the square, where the Ghiberti family lived, and situated opposite Palazzo Ciompi there is �Loggia del Pesce�, designed by Vasari simple and straight in design. In front of the building there is car parking for about 12 cars.Inside there is a reception area to receive and assist guests. Every apartment has central heating, air conditioning telephone and separate connections for internet and satellite TV. This delightful studio has recently been converted from an old barn and has large arched glass doors opening to the patio and pretty �English� style garden which has views to the hills. There are lovely walks into the countryside directly from the house which is conveniently situated within walking distance of the small town of Asciano which has bars, bank, restaurants, and shops. On a verdant hilltop just off of a short country road, this cottage offers remarkable views over the wooded hills covered in old chestnut-trees. Completely surrounded by a garden the cottage a double bedroom; two single bedrooms and a two bathrooms. Outdoor, where you can enjoy the silence, there is a gazebo for dining al fresco. Monticiano is 15 minutes' walk, with restaurants and shops. Originally a simple barn used to store plants during the cold winter, it has been recently restored to provide comfortable, modern accommodation for two people. Fresh and bright this ground floor house has big French windows opening onto the grassy garden, furnished with table and chairs for al fresco dinners under the pergola. Air condition and central heating available. Free entrance for the guests to the swimming pool of the nearby hotel.